You know me – I have to knit – can’t sit still if I am not knitting. I had planned to be working on new jumper knitting pattern – I did promise that I would work up the ‘Joseph’ in several other sizes – but with everything that has been going on my brains are mashed potatoes at the moment – but I still have to knit!!! What to do? I need something. So – here we go – knit strips and make some blankets. I get to knit and play with colours – without over taxing what’s left of the mash – what’s not to like? This is the smallest size. Worked with a chunky weight yarn on slightly smaller needles than normal you get a lovely soft, thick, snuggly blanket which will keep your pet really cozy – and as it’s Robin acrylic – you can wash it over and over again and it will come up like new. Now I am ‘in the zone’ I am playing with colours. 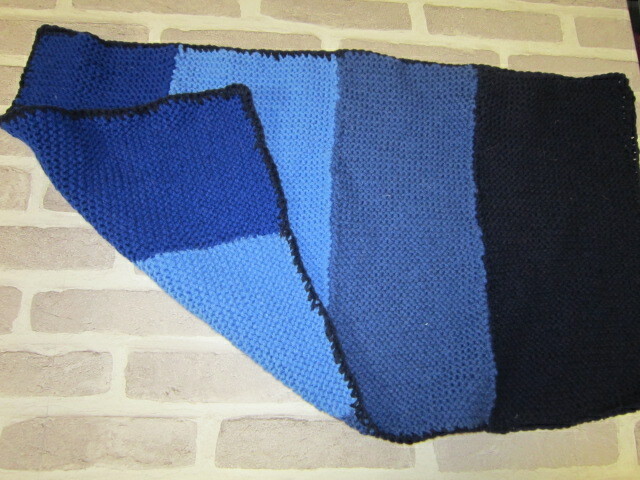 The next blanket will be bigger – and a mix of 3 purples and an aqua colour. Not finalised the prices yet – but they will be similar to an equivalent sized jumper.